Help even skin tone and texture and reveal naturally radiant skin with Aveeno Positively Radiant Daily Moisturizer with Broad Spectrum SPF 15. For all skin types, this daily moisturizer with sunscreen is clinically shown to help improve tone, texture, dullness, blotchiness, and brown spots. With Active Naturals Total Soy Complex and natural light diffusers, this formula works to help even skin tone and texture and reflect light to visibly smooth imperfections. 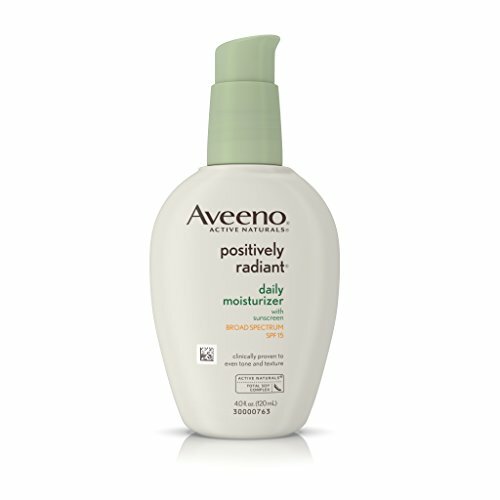 Aveeno Positively Radiant Daily Moisturizer with Broad Spectrum SPF 15 is oil-free, hypoallergenic, and non-comedogenic, and it includes broad spectrum SPF 15 to help protect your skin from further sun damage. Reapply - after 80 minutes of swimming or sweating, immediately after towel drying, at least every 2 hours. If you have any questions about this product by Aveeno, contact us by completing and submitting the form below. If you are looking for a specif part number, please include it with your message.